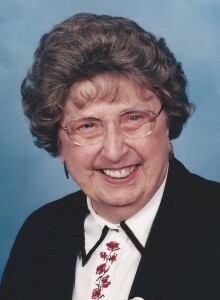 Adrienne Maria Nelles, age 94, passed away Wed., Feb. 22, 2012, at Mira Vista Care Center in Mount Vernon, Wash. She was born March 4, 1917, in Grasmere, Wash., to Richard and Emma (Ruuth) Thompson. Adrienne grew up in Concrete attending school and graduated from Concrete High School in 1935. She then attended nursing school at Virginia Mason Hospital in Seattle attaining her Registered Nursing Degree. She was married to Grant H. Nelles on June 16, 1940, in Marysville. They returned to Concrete residing on the family homestead at Grasmere. Adrienne worked as an R.N. for Dr. Monzingo at the Concrete Doctor Clinic for many years and she also did special nursing care. She assisted her husband as a bookkeeper for Thompson Welding & Blacksmith Shop and later at Leveque Co. in Concrete. She was later the bookkeeper for Hamilton Cedar Products in Punkin Center. Adrienne was an active member of Community Bible Church, serving as treasurer for many years, and she also was secretary-treasurer for the Hamilton Cemetery Association. She was on the board for Skagit Parks & Recreation and Skagit County Historical Museum for many years, as well as being past Noble Grand and treasurer of the Rebecca Lodge. Adrienne enjoyed reading, gardening, and in her younger years, bowling and singing in the church choir. She is survived by her two sons, Richard Nelles and his wife Linda of Punkin Center, and Roger Nelles and his wife Patricia of Wasilla, Alaska; three grandchildren, Belinda Rogge and her husband Paul and their son Tyler of Concrete, Jeff Nelles and his wife Heather and their children, Taylor and Zoe of Palmer, Alaska, and Jennifer Fritz and her husband David and their children, Alexis and Hunter Hall of Wasilla, Alaska; a special dear friend, Doris Priesel of Concrete; and numerous nieces, nephews, and cousins. Adrienne was preceded in death by her parents; her husband Grant in 1984; two daughters, Katherine and Anna Marie; a brother, Fred Thompson, a daughter-in-law, Delma Nelles; and a granddaughter, Sandra Jean Nelles. Graveside services will be Tue., Feb. 28, 2012, at 11 a.m. at Hamilton Cemetery with a Celebration of Life Memorial Service to follow at 1 p.m. at Community Bible Church in Concrete with Pastor Rob Thomas officiating. A reception will follow the services at the CCD Center in Concrete. Visitation will be available on Fri., Sat., and Mon. (Feb. 24, 25, and 27) from 9 a.m. to 5 p.m. and Mon. evening, Feb. 27, from 7 p.m. to 8 p.m. at Lemley Chapel, Sedro-Woolley. Memorials are suggested to Community Bible Church Missionary Fund or the American Diabetes Association. Share your memories of Adrienne and sign the online guestbook at www.lemleychapel.com.